Mint : Miletus Date : Posthumus issue ca. 323 to 319 BC. Reference : Price - 2121. Size : 15.8 x 16.1 mm. Weight : 4.22 grams. 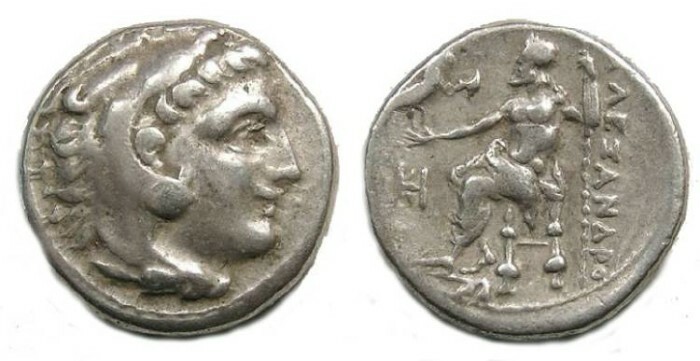 Reverse : Zeus seated left, holding a sceptre and eagle, with with ALEXANDRO to the right (the Y at the end of the name is missing but appears to have been intentionally left off the die due to space restrictions), with an uncertain Greek letter monogram below Zeus' hand.